Onlywire is best known for their WordPress plugin for social sharing. As a platform, it offers the same functionality of sharing content, but it also offers Analytics. Onlywire is a solid tool for automating your website updates on many social networks. 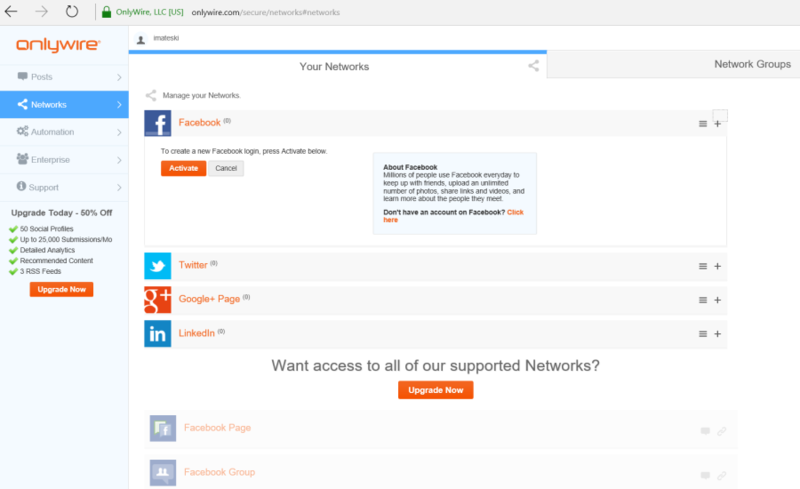 The Premium package boasts 50 social networking sites it can auto-post your website updates. It also boasts 3 RSS feeds, which could mean that you have 3 main categories you feed auto-posts on social sites or 3 different sites altogether. Onlywire’s free package is suitable for general users who only do activism or writing blog posts is their hobby. The free plan allows connection to only 4 social sites, whereas the Pro version offers 50 social sites (but it’s actually 34 when you count them). Connecting your social profiles is fairly simple. For Facebook, you will need to go through the standard steps Facebook requires to set who will see the updates Onlywire posts (Me, Friends, Public). Twitter is fairly simple, but with Google+ you will need to pay attention as you can select which pages you want to connect. In my case, I had 3 pages I managed under my G+ profile, so if you run through the setup you may end up having Onlywire to post updates on Google+ pages where you shouldn’t be posting. Linkedin also has the standard setup, and you do get a notification that there’s a 25-day limitation of posts, enforced by Linkedin itself. 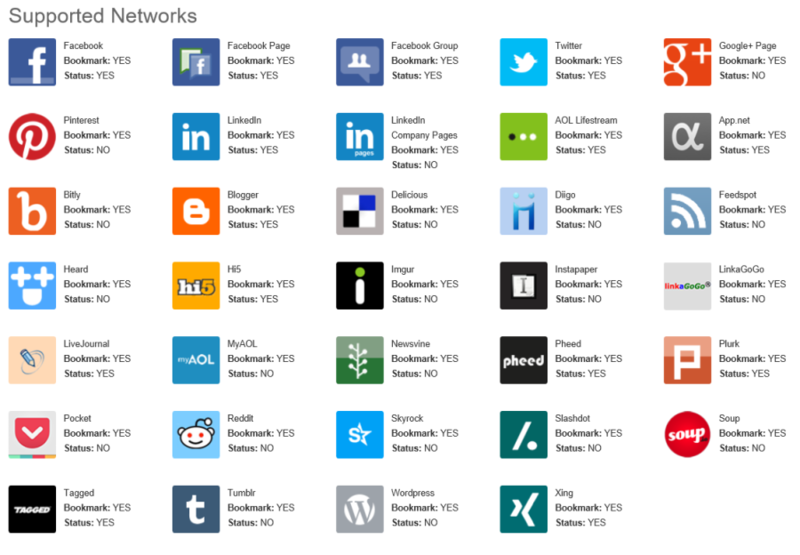 Once you’re set with connecting your Onlywire with social networks, the next step is to go to the Automation tab on the left-side navigation pane and set up a new RSS feed. The key here is that Onlywire will pull your entire RSS feed, but it will only post old materials published in the past 72 to 12 hours… or you can have Onlywire to auto-post only new materials that you’d be publishing later on. You can’t spam your social audience with duplicate posts, as Onlywire will check the URL and Title of the posts, which is a good feature. The Pro and Enterprise versions will be great for people who have a more serious online presence, and a more demanding social media activity for their company or cause. I must admit that many of these social sites are somewhat anonymous. Some may say they’re more audience-specific, but the point here is that you’ll be paying for a feature that isn’t all that interesting to many people. Very few will bother with Xing, Hi5, MyAOL, App.net and so on. Regarding automated posting, Onlywire connects to tons of services. Some of them are industry dinosaurs (anyone remembers Hi5? ), and some are area-specific, audience-specific networks such as Xing (most users are corporate-level Europeans). Onlywire performs the auto-posting by connecting the RSS feed from your site and feeds the news onto social sites. This is the standard way to do automation, and Onlywire does it well. It does allow posting updates and placing bookmarks… but that’s about it. There is no scheduling of the pulled RSS updates, no reports, no ability to fine-tune posts that go out on different social media sites. 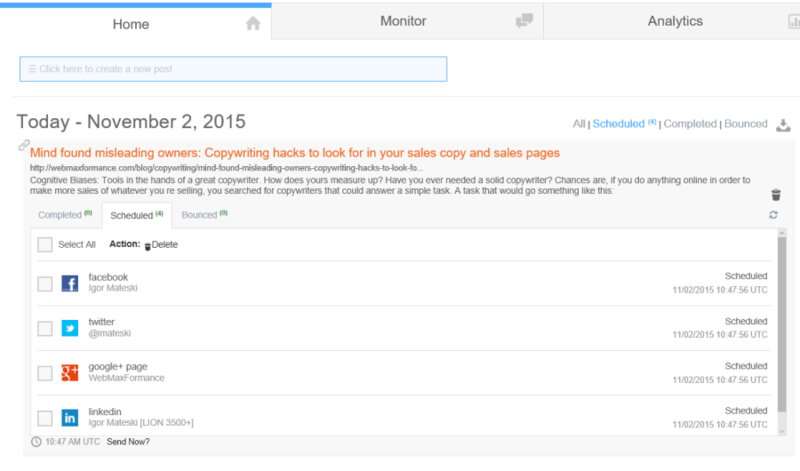 The screenshot above shows how a scheduler RSS update details look like. You can toggle social profiles, but you can’t edit the title, description or the posting time for each of the social profiles. While this makes things as simple as point and click, many marketers will be left hanging as they cannot edit the message that goes out to say Twitter. Regardless of its simplicity, there are features that the modern marketer will find desperately lacking. For example, you cannot set a timezone, so figuring out when each post is scheduled for is a bit of an annoyance. 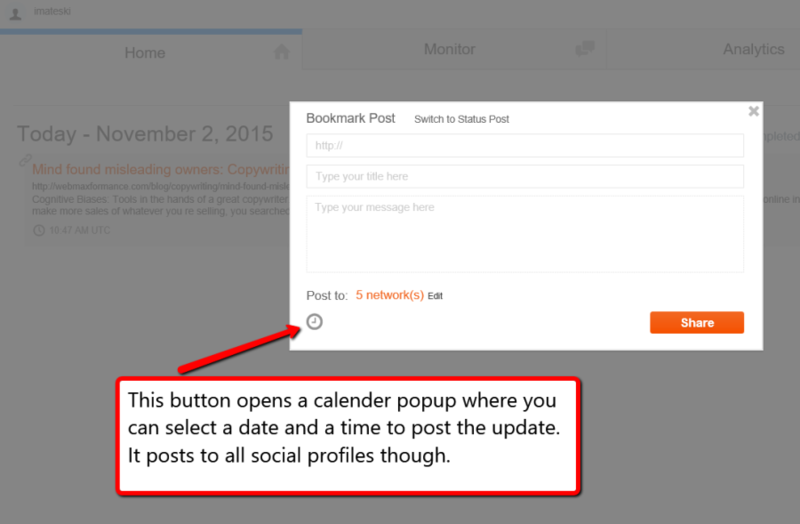 The good thing is that you can insert social updates and schedule them any way you want them. But even in this feature, there are functionalities lacking. If you want to have a way to post an update to a single network, you will have to re-create the same update for each of the social networks separately, which is a bit cumbersome with all the copy-paste work you’d have to do. It seems to me that this manual scheduler is an after-thought… it’s there, but it sort of isn’t well thought-through. The Analytics capabilities of Onlywire are somewhat ok. In reality, you only get fed data from Twitter, Facebook and Bit.ly analytics. This makes the Onlywire Analytics more of a combined stats counter rather than its own full-fledged analytics reporting tool. I’d rather have the ability to connect to Google Analytics rather than bit.ly mostly because Onlywire doesn’t allow me to connect my bit.ly account and then pass all URLs to be shortened through my personal bitly account. This makes click-tracking a bit of a puzzle, which defeats the logic of even having an Analytics tab that doesn’t give me such a key metric. Onlywire has plenty of features that plenty of people will find plenty satisfactory. My top favorite is connectivity. Even in the free version, I get to have basic functionality of connecting my website to a Facebook profile and from then on, select which page I want to post updates on. The Twitter connectivity is fairly simple, as it ought to be. I like the ability to pick pages under the Google+ profile too. The analytics are there, so I can look at how my activity looks like on Facebook, Twitter, Bitly. So all’s not lost even though there are tons of things missing. Scheduled posts are possible… but only just. We can put a checkmark on this feature but I don’t see myself using it too much. Automated posting on social profiles works perfectly though Onlwire started with it, and it’s doing this job quite well. They also offer an ability to engage your audience in conversation, which is a great thing as a social activity is a two-way street and Onlywire seem to have a good grasp of just how important that is. They call this feature Monitoring… but it’s only available to premium users. I hate being the devil’s advocate, but as I was going through the interface, for whatever reason, I found something lacking on just about any feature. This isn’t to say that Onlywire is not a good platform. It’s great… but it can’t be awesome because of several key issues. The Scheduler is not very nicely built. 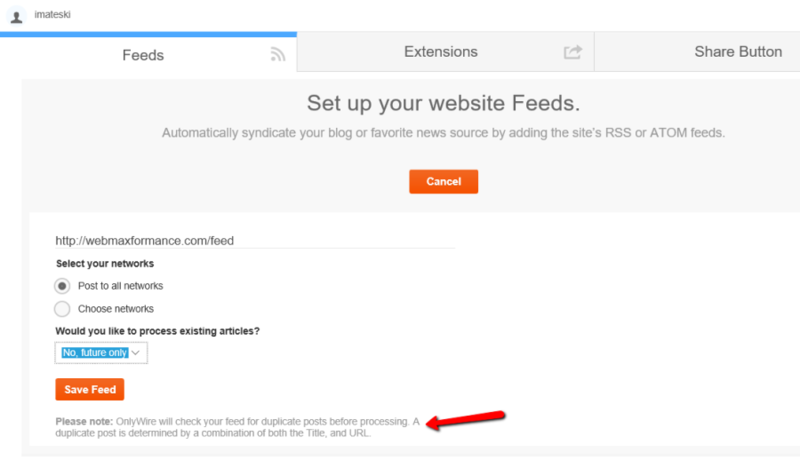 While it does allow you to post scheduled updates, it won’t let you pull RSS updates and schedule them to auto-post on the desired date. In some cases, I’d want to be able to post a pillar article on Facebook say every month. This isn’t a big deal and isn’t so “bad” practice and I’m puzzled as to why Onlywire won’t allow me to schedule an RSS update. I could schedule this pillar article manually, but I’d have to do this for every single update. If I want to schedule monthly postings that are 12 manually scheduled posts for a single article. If I have, let’s say monthly pillar articles, I’d need to put together 144 manually scheduled posts… not to mention that if I want a different update do go to Twitter and a different text to go on Facebook… things get even more complicated. The Analytics is quite rudimentary. It only pulls information from Facebook, Twitter, and Bitly (why?). It doesn’t, however, give you a reliable way to track all channels and see which social update got more traction. It would be far better to just connect with Google Analytics and offer a customized Dashboard for social activity. Connectivity with Pinterest (for free use), Google Analytics, Bitly (for shortening rather than simple clicks counter), are just some of the things lacking. Many users could care less about somewhat outdated social sites, and instead of just adding them for the sake of numbers, I’d rather prefer to have Onlywire offer more features up-front for free users and allow solo-preneurs to grow their business instead of asking premium prices for let’s say the Monitoring feature, which enables two-way communication. Onlywire is a solid and reliable social auto-poster. With the WordPress plugin for social sharing, it makes life a lot easier. It is feature-rich. I love the ability to connect an RSS feed with a Facebook Page or a Group. I also love the ability to track activity with the Monitoring tab and engage my audience in conversation. That’s fabulous. But I’d want to see this functionality in the Free package as well. It could be limited to say 100 comments per month or something like that… instead of being completely locked up for premium users. One of the turn-down points for me are the extremely limited Analytics and very unfriendly Scheduler functionality. Without the ability to track actual clicks, and without a streamlined Scheduler, I’m afraid Onlywire will leave many potential clients looking elsewhere. Some will find both Analytics and Scheduler to be sufficient. But most won’t. An Analytics tab that shows clicks from Bitly while not enabling you to connect your bitly account to do all the shortening, is a major miss. Having a Scheduler that won’t allow you to schedule updates from your RSS feed is also a serious oversight. And combined with the rudimentary Manual Updates Scheduler, something tells me that a lot of marketing professionals will move onto the next social automation tool, dragging their feet in the dust, being utterly unhappy and disappointed because Onlywire is so close to being a great tool… but it isn’t.